Suicide is a leading killer in college. It's time to talk about it. 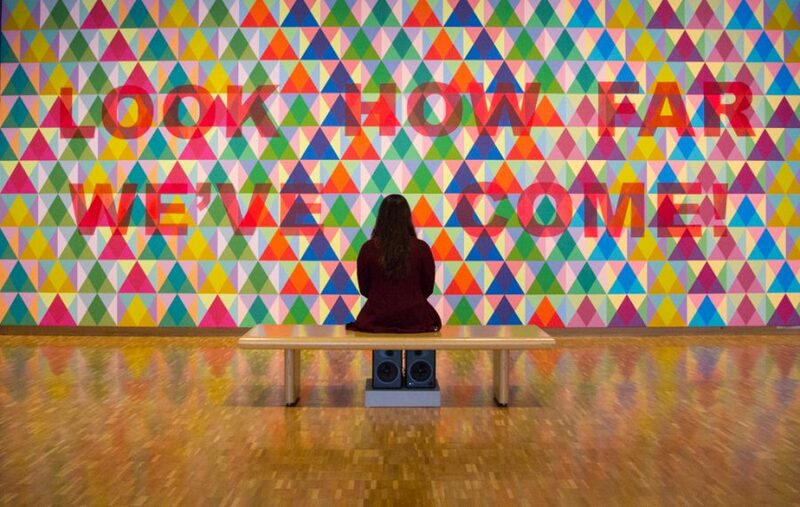 Courtesy of the artist Jeffrey Gibson, included in the Haggerty Museum of Art’s exhibition, "Look How Far We’ve Come!" Late one night last summer, Marie Crowe found herself standing on a bridge above a highway in her hometown, typing what she expected to be her last words. Crowe, now a sophomore in the College of Health Sciences, felt the urge to jump — to end her life. She hit send, not realizing she accidentally sent the text to her dad. Then, her phone rang. “Where are you?” her father asked. He told her to stay put. He and a friend drove to pick her up. Crowe sat with her father until nearly midnight, crying. A week later, her boyfriend ended the relationship. Crowe deteriorated. She made new plans to kill herself. Then, Crowe made a difficult decision. She checked herself into a mental health facility. In the adult psychiatric ward, she met others struggling with problems of their own. For three days, she did day-long therapy, colored and talked with her fellow patients. Crowe focused her energy inward. She recorded details of the visit to remember the experience, despite the days becoming “fuzzy” from her medications. The hospital was not how she expected it to be. She would later write on her blog that it was not like “the movies or on TV.” And while her three days at the Linden Oaks Behavioral Health facility brought her newfound strength, she emerged with new worries as well. Mostly, though, she learned not to worry about what others thought of her. Halfway down the long hallway that is the Marquette University Counseling Center, Nick Jenkins’ office radiates warmth and comfort. In the soft glow of table lamps, the sound of cars whirring down Wisconsin Avenue is the only reminder of the world outside. Tough conversations happen here. As a counselor and the center’s coordinator for mental health advocacy, Jenkins works with at-risk students, trains others to notice warning signs and tests new technology in suicide prevention across campus. Data paints an insidious picture. Across the country, suicide clusters and understaffed counseling centers continue to make headlines. Suicide is a leading cause of death for college students and the second-leading cause of death in people ages 15-24. According to the Centers for Disease Control and Prevention, the only thing that kills more people in this age group is unintentional injury, such as car crashes. A 2012 analysis by the Suicide Prevention Resource Center found 6.6 to 7.5 percent of college undergrads seriously considered suicide in the 12 months prior to being surveyed. More than two percent made plans and more than one percent attempted to kill themselves. Marquette’s numbers are no better. 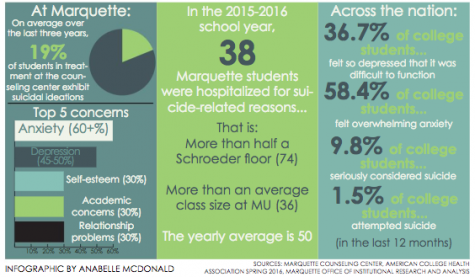 Last year, 38 Marquette students were hospitalized for suicidal ideation or suicide-related reasons, below the university’s annual average of 50, according to data provided to the Marquette Wire by the Counseling Center. Even then, the count could be low, Jenkins cautioned. The count only includes hospitalizations if the Marquette University Police Department, the Counseling Center or another arm of the university became involved. The same goes for tracking suicide attempts. 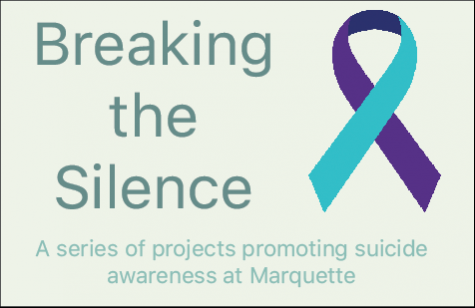 Jenkins estimates one Marquette student dies by suicide each year. Some years there have been none the university was aware of. 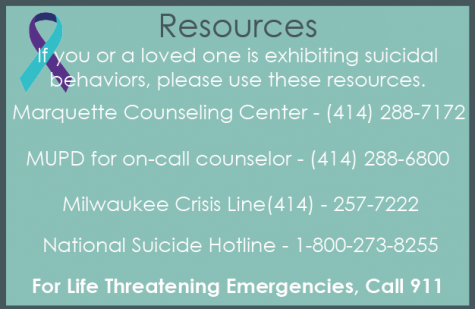 On average, 19 percent of students who had counseling at Marquette reported suicidal thoughts. Barbara Moser, chair of Prevent Suicide Greater Milwaukee, explained that major stressors in a student’s life can sometimes be exacerbated by a lack of proper coping mechanisms. Examples of these major stressors include relationship difficulties, exposure to drugs and alcohol, peer pressure and academic or financial concerns. Moser spent her 30-year career working in college health settings. She worked at the University of Wisconsin-Milwaukee for 23 years, eventually spearheading the university’s major effort to train nearly 2,000 community members to identify and reach out to students in distress via the Campus Connect program. Mood disorders can also underlie suicidal ideation/thoughts, Jenkins explained. Intake screening from the last three years at the Counseling Center shows Marquette students consistently report concerns with anxiety (over 60 percent) and depression (45-50 percent) as their top two concerns. While not all of these students experience suicidal thoughts, the trickle-down impact of a mood disorder can be strong. Crowe’s first panic attack hit when she visited Marquette as a high school senior. It is now her third year living with anxiety and depression. 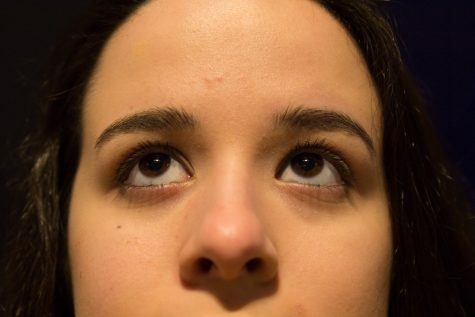 This semester, her doctors finally made an official diagnosis: rapid-cycling bipolar disorder. This is not always the case. The timing and environment of college also play a major role. 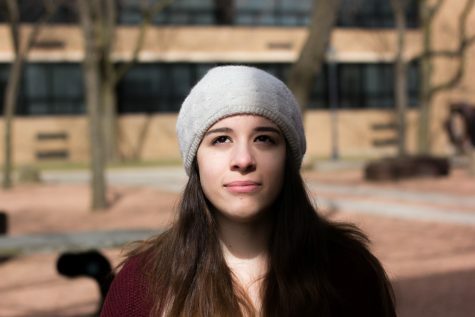 College students are at the age when many mental illnesses are diagnosed, such as schizophrenia, bipolar disorder and clinical depression, Moser explained. These disorders are risk factors for suicidal behavior. More universally, college is a major time of transition. Response to such a widespread, yet deeply personal, struggle is something that universities across the country continue to refine and revisit, some more successfully than others. At Columbia University, parents, students and staff are pushing for more training and discussion in the wake of four confirmed student deaths by suicide this academic year and six undergraduate deaths overall. The losses are shifting attention to the urgency of prevention methods, some would say, too late. Sophomore Marie Crowe sought help after suffering from suicidal thoughts. Photo by Andrew Himmelberg. In September 2015, as then-freshman Crowe finished her first weeks in college, a group of about 25 faculty and staff in the College of Engineering gathered for a voluntary training session to identify and help suicidal students. “Question, Persuade, Refer,” or QPR, training is used on campuses across the country to increase the number of community gatekeepers: people who are aware of the signs that a person is suicidal and how to get them help. For some, the experience brought home a sobering realization. Experts explained this is why widespread gatekeeper training is so important. When it comes to pinpointing risk and the state of a person’s mental health, the truth can be a moving target. As a 2009 University of Texas at Austin study of 70 U.S. colleges and universities (including Marquette) found, the most important gatekeepers are students. Two-thirds of the students who told someone about their suicidal ideation chose to tell a peer. And when it comes to identifying the signs, Moser said, time is of the essence. Since August 2015, the Counseling Center gave 1,221 people suicide prevention training, the majority in QPR. Training is mandatory for resident assistants, while other groups, like the College of Engineering faculty, AMU staff and Marquette’s Sigma Phi Epsilon fraternity, chose to be trained voluntarily. The Counseling Center also strives to maintain low wait times (maximum two weeks), and a full-time counselor-to-student ratio that allows for optimal care. There is currently one counselor for every 942 students at Marquette, compared to a national average of 1 to 2,454 for other schools of Marquette’s size. The International Association of Counseling Services recommends not going over 1,000 students per counselor. Efforts by student groups like Active Minds and Sigma Phi Epsilon Fraternity also work to increase awareness. Sig Ep’s work within its own organization addresses another dire statistic: The CDC states that while women are more likely to experience suicidal thoughts, men are four times more likely to die by suicide. That’s where another number from the University of Texas at Austin study comes in. Of the students who reported having suicidal thoughts in the last 12 months, 46 percent of undergraduates and 47 percent of graduates chose not to tell anyone. The stigma surrounding mental health continues to present a major challenge. Crowe now dreams of being a mental health researcher. She will spend this summer doing mental health research on campus. Crowe also took up spoken word poetry, and said she is excited to be an upperclassman next year. “People don’t see how strong you have to be to overcome it, and it’s more like you’re damaged,” she said. Her openness about her experience with suicide and self-harm have been met with hesitant responses. She said while sharing her story helps her, she hopes it will tell others that they are not alone. Crowe said she wished she had had a conversation like that. Crowe recalled an unseasonably warm January day when she took a walk to the lake. She sat on a large rock watching the waves ebb and flow beneath her. Our Son was a first year student at Ripon College and took his life on Nov 7. I visited Ripon College on Friday for the first time since Jack’s suicide to facilitate knowledge sharing with students. I also plan to talk at this years orientation to the parents about triggers, stressors, behavior changes, etc. It was anxiety to depression in a perceived stressor situation that drove Jack to suicide. Combos of stimulants to self medicate no doubt were accelerants. They say it is easy to pick the winner of a horse race the day after; there were obvious signs of anxiety disorder which he mitigated by training, diet, and meditation. I just listened to Devi and Jenny this morning talk about the engagement they are leading at Marquette University to raise awareness, support, and vigilance on mental illness. And I want to thank you for what you are doing in “making a difference” on this dark issue.